When the masters of Japan take on some new aspect of a foreign culture it isn’t long before they are doing it better than the originators. This appears true in cuisine, film and music, and a supreme example is the Mighty Crown Sound System. A crew born and bred in Yokohama , Nippon , the selectors consistently dominate reggae sound clashes, beating out all participants including actual Jamaican soundboys from Kingston to MoBay. With this in my roots-starved mind, I poked around Tokyo in search of some reggae flavor, only to come up with little more than some Harajuku market stores blasting dancehall both of Caribbean and more homegrown origins. My local contacts had no clue where I could go for authentic reggae, though they did know where to find other considerably kind exports in the metropolis formerly known as Edo. Funnily enough, it was in Kyoto — Japan s most traditional city–that I finally encountered some authentic rootsy -ness. Sure enough, it was the music blasting from central Kyoto s Rub a Dub that seemed like the real deal, proudly promoting its historic status since 1985. Apparently a Kyoto local, Nick Tatsufumi Yamamoto opened the bar as a gift to his Jamaican wife and to bring his years of island living to his hometown. Descending into the sub-cement bar room one or two streets west of the historic Pontocho lane and slightly south of Sanjo and Kiyamachi streets, a very irie vibe was in full effect squeezed into typically tight confines. With a full menu of treats from back-a-yard such as ital salad and curry chicken with coconut, I found the place where I was most likely to find well, people like me: reggae fanatics from near and far. Hailing my new friends with a hearty Yes-I, fists were pumped and a raucous greeting welcomed me! In a matter of moments, I was sharing fruit daiquiris and ginger beer with a crew of Japanese rudeboys and some more upscale worker bees letting loose. The atmosphere was breezy with a tropical look dominating the tiny space and the bass booming. Bananas hung along red, gold and green lights from the ceiling, framing a collection of Caribbean rums, Jamaican signs and fake palm trees. As Id found, the experience was true to form–dancing broke out and the massive swelled into the late hours for real rocksteady, ska, roots reggae and a little dancehall. Apparently the Rub A Dub stays open fairly late for a Japanese bar (2AM) and is really hopping on weekends when it stays open until 4AM. When you are exploring Kyoto and feel reggae-mylitis coming on, head straight for the Rub A Dub. 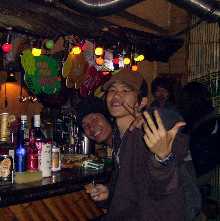 There are a few reggae bars hiding in Kyoto , but Rub A Dub was the first and supposedly the best. A true original. Kampaii mi bredren and sistren! !